Can I just tell all of you how much I LOVE my Cricut!?! For those of you who don't have a paper cutting machine, I'm sorry. Save your pennies and get one. It will be SOOO worth it. If you've been following me since at least Halloween, you know about my 36" of table space for any type of Holiday decorating. It's pretty much all I have with the exception of my mantle. After whipping up a few things from paper, this is what I've created for Christmas. This artwork is actually using the same frames I used for my Thanksgiving artwork, which were an unfinished light wood. I didn't want that look for my Christmas vignette, so I modified the frames by "re-facing" them with white posterboard. I cut a "frame" to fit, and then cut 1/2" wide strips to cover the inside thickness of the wood frame. Sadly, I don't have a color printer, so I usually have to pass up all those awesome holiday printables out there. However, someone (I'm sorry, I don't remember who) offered one that would print fine in black and white. Thank you whoever you are, for this sweet Subway Art. The little Santa on the left is "vintage"... well, it's something I've had since I was a child. Unfortunately, I don't remember the story behind it. Maybe, once my Mom reads this, she will enlighten me. And now for the snowman... a couple of little black circles, an orange triangle, a hand cut hat, and a scrap piece of wired ribbon for a scarf. Stick them all on a lampshade and voila, totally cute Snowman!! I'm linking up here... be sure to visit them and see all the other awesome projects. It ALL looks so great! I looove the JOY frames and the snowman! Lovely vignette as always! Would love for you to link this up as well! Very cute idea for the snowman. I like your "Joy frames". I made "joy frames" for my kitchen. I'll be posting them in a few days. Oh, I love the JOY frames and the snowman just makes me smile! 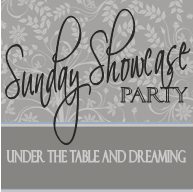 I am having a link party on my blog, beginning Sunday night. I'd love for you to link up your projects. The theme of the party is projects made with a Silhouette or Cricut. I'm so glad you joined my party with all your great projects. It will be hard to decide what to try first. Merry Christmas!! I found your blog on Pinterest. Your snowman is absolutely adorable! I can't wait for Christmas to get here so I can decorate.